It’s almost impossible to review this one without spoilers. Suffice it to say that this is what fans of the Vorkosigan universe have been waiting for since the ending of Cryoburn. Set three years after those events, this is a lovely, strange, and mature romantic comedy with science-fiction packaging – some of that quite thought-provoking. It is also a Secret History of the Aral / Cordelia marriage, an advanced course in Betan vs. Barrayaran thinking, and a number of other delightful things, all delivered with style and wit. What is isn’t is the sort of space opera Bujold does very well. It took me a few chapters to realize this wasn’t forthcoming, and I was slightly confused until I did. I also suspect that this book may resonate more with readers who are parents than with those of us who aren’t. However, it’s a must for all fans of this series – and very likely to result in frantic rereading of the earlier books. First published in 1969, Le Guin’s classic novel of gender, diplomacy, friendship, adventure, and heartbreaking choices on an Ice Age planet is as fresh as ever. SF readers who prefer a “full immersion” experience -- or anyone who appreciates hard questions combined with jaw-droppingly lovely prose – should not miss it. This was my second reading. I suspect it would reward several more. 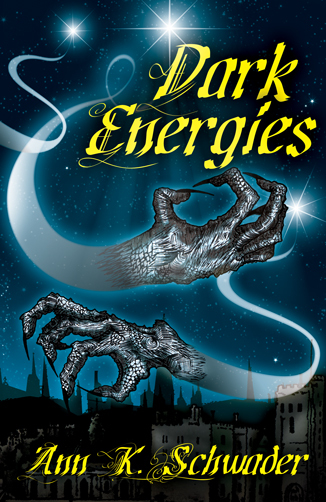 And now, the poetic darkness: Dark Energies available for preorder! I haven’t posted about this poetry project before, because I wasn’t at all sure when it would be available . . . but I’ve finally been told that it’s coming out for Lovecraft’s 125th birthday. Dark Energies is my first collection of poems since 2011 -- and my first collection ever published in Australia, from P’rea Press. It’s a little over 100 pages of Lovecraftian, cosmic, archaeological, historical, & just plain weird darkness, including a brand-new sonnet sequence for Keziah Mason. The cover and elegantly creepy black & white illustrations are by David Schembri, with preface and afterword by S.T. Joshi and Robert M. Price, respectively. There’s also a short interview with me, done by editor Charles Lovecraft. Dark Energies will be available in both paperback & hardcover editions (another first for Yours Truly), with an ebook format to follow later on.